Happy Valentine’s Day! Today, I’m going to share a little project that I put together for my husband for Valentine’s Day. This would also be a great anniversary gift for someone. 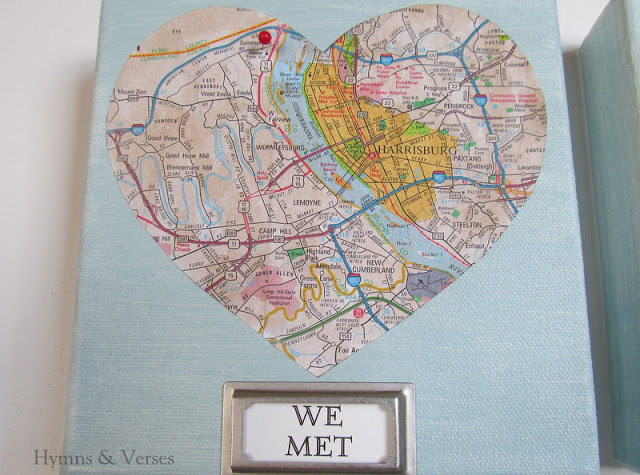 I was inspired by this project on Pinterest, but wanted to give it my own twist – We Met, We Married, We Lived, We Love Map Art. Here are the supplies you will need. The most expensive item here is the artist canvas 4 pack. Use a 50% off coupon at Michael’s and it will be about $7 for the pack. I had the Martha Stewart metal tag holders left over from another project. If you don’t want to buy them, you could just use paper labels. 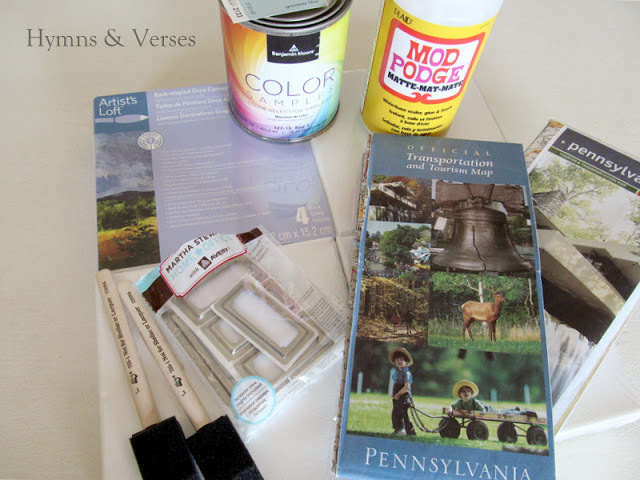 Paint your four canvas pieces the color of your choice. I used a sample of paint color I had on hand. 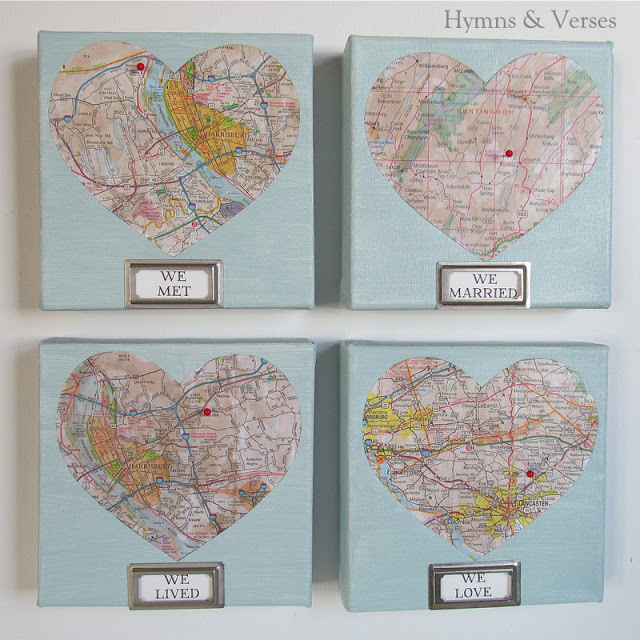 While the paint is drying, gather your maps and find the locations where you and your spouse met, married, lived, and now love. We have lived in Pennsylvania for all of those events, so I needed 3 different Pennsylvania maps. My father-in-law gave me two maps and I found the other in the garage. 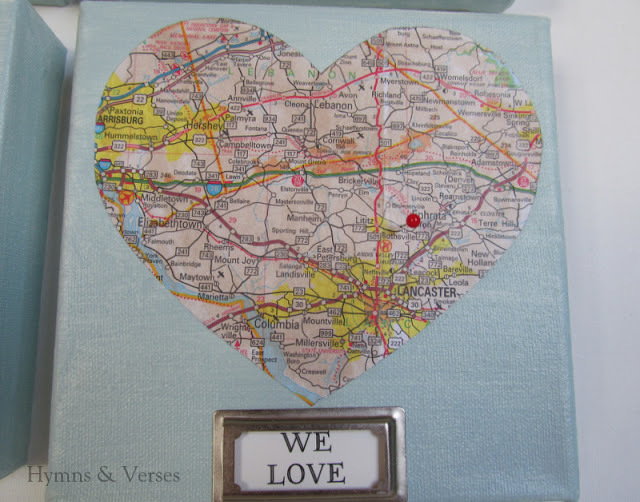 Make a heart template that is just slightly smaller than your canvas, making sure to leave enough room for your label at the bottom, and use it to trace the areas needed for the four heart locations and cut them out. The next step is optional. 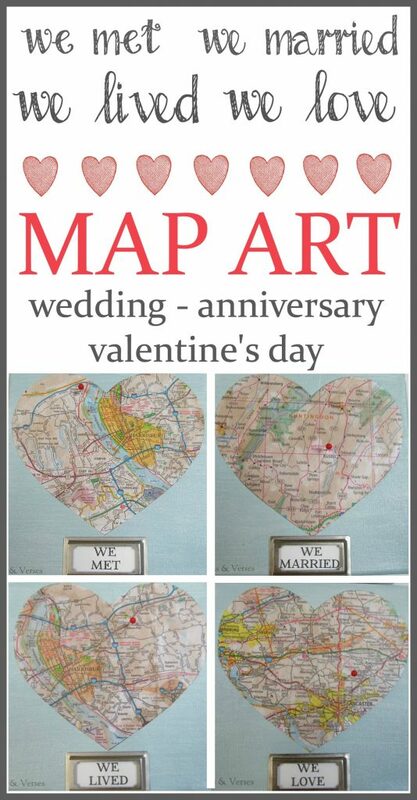 My maps were fairly new and I like things to look old, so I tea died the paper hearts to make them not so white. Once they were dry, I used an iron (not too hot) on the reverse to remove the wrinkles from the paper hearts. Then use your Modge Podge to apply each heart to each painted canvas. Apply two coats of Modge Podge, letting dry completely between coats. Now make your labels – We Met, We Married, We Lived, We Love. I used Word and printed them out from my printer. Center each metal tag or label under the corresponding heart. 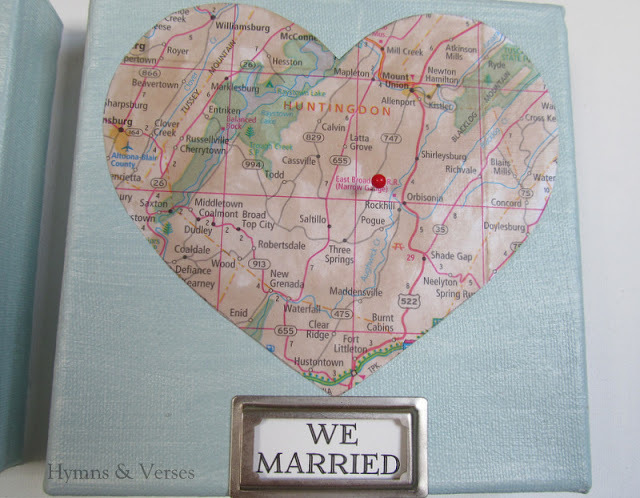 Finally, I used red ball top sewing pins to mark the specific locations on each map heart. I used wire cutters to cut them down to about 1/4 inch and just poked them into the canvas at the appropriate location. I chose to hang my canvases in a square, but you could line them up horizontally or vertically too. Wishing you all a fun Valentine’s Day with your special someone! What a beautiful idea – and a beautiful job!!! Hi! I found your project in the "Charm of Home" link party. 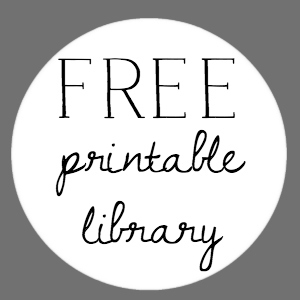 It caught my eye because I made the project that you pinned for inspiration! I love your version, too! I am sure your hubby will love your gift. Maps hold a lot of memories, don't they?? This is fabulous – love that you took it to the next level with those cute little tags. 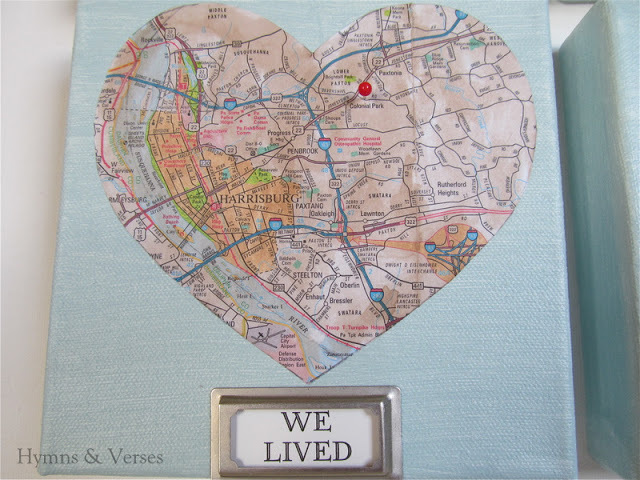 What part of PA did you live – I grew up in Bucks County. Pinning this – thanks for sharing! I absolutely love this project too! I was so sorry shortly there after I posted did my computer go wonky that day. I will have to refresh this in a few and get it out there again. Thank you for sharing with me. What a great project–I know your husband will love this! Love them, such a neat project! Visiting from Common Ground! I so love this!! I am going to do something like this for our anniversary. Great job ( as usual) I am sharing on my weekly wow's on Saturday. I love this sweet project! Seriously darling! Thanks so much for sharing. Pinning. I love this! What a thoughtful, beautiful, creative gift. You did a wonderful job. This is wonderful!! I just love it! such a sweet project! 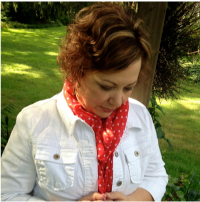 and i love finding local bloggers…i'm just south of philadelphia. 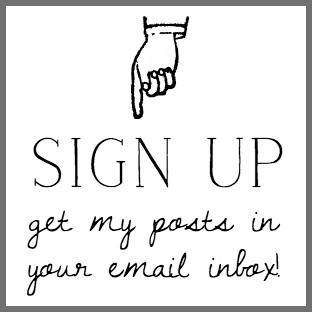 I would like to invite you to join my linky party, Thrifty Thursday! I love this! I honestly will have to do this–thanks for sharing!